Do your eyes look puffy or swollen? When fluid builds up in the thin layers of tissue surrounding your eyes, your eyes and eyelids can swell. But when is it cause for concern? Typically, eye swelling in your upper or lower eyelid is just an uncomfortable annoyance that will go away on its own within a day. But if the swelling lasts longer, it’s important to treat it because some problems can quickly damage your eyes. “Any swelling that lasts longer than 24 to 48 hours should send you to an eye care professional because there are times it can be something severe that can blind you,” says ophthalmologist Annapurna Singh, MD. Allergies – This is a common problem that is also the simplest to treat. These can be due to hay fever or a reaction to foods, chemicals or other irritants. Conjunctivitis – Also known as pink eye, this infection is common during cold and flu season. It’s often caused by a virus, bacteria, allergens or other irritants. Stye – An infection in an eyelash follicle or tear gland, styes appears as tender, red bumps at the edge of your eyelids. Chalazion – Similar to a stye, a chalazion is a harmless, small bump that appears on your eyelid. Blocked oil glands cause chalazia. Orbital cellulitis – This inflammation, which spreads from your sinuses, occurs more often in children than in adults. It causes redness and painful swelling of your eyelid and the skin surrounding your eyes. Trauma-related injuries – When blunt force strikes, your eye compresses and retracts, causing blood to gather underneath the damaged area. This often causes swelling and discoloration. Graves disease – Also known as thyroid eye disease, Graves disease is an autoimmune condition that causes inflammation of your eye. It relates to a thyroid problem. Eye cancer – This is rarely the reason for swelling in or around your eyes. However, it is a symptom. Eye cancer, or an eye lymphoma, is also accompanied by blurred vision or loss of vision. You may also see floaters — spots or squiggles — slowly moving in your field of vision. Wash or rinse. Try rinsing your eyes with water if swelling is associated with a discharge. Cool water is more soothing for allergies. Try a cool compress. Lie down and place a water-soaked washcloth across your eyes. Remove contacts. If you wear contact lenses, remove them immediately if your eyes or eyelids are swollen. Sensation that something’s stuck inside your eye. To ensure that your eyes remain healthy, regular eye exams are a good idea — whether or not you’ve experienced swelling in your eyes, Dr. Singh says. “One of the reasons to have regular eye exams is to check for glaucoma, which can slowly damage the optic nerve – and for an early cataract, which clouds the lens in the eye and also affects your vision,” she says. 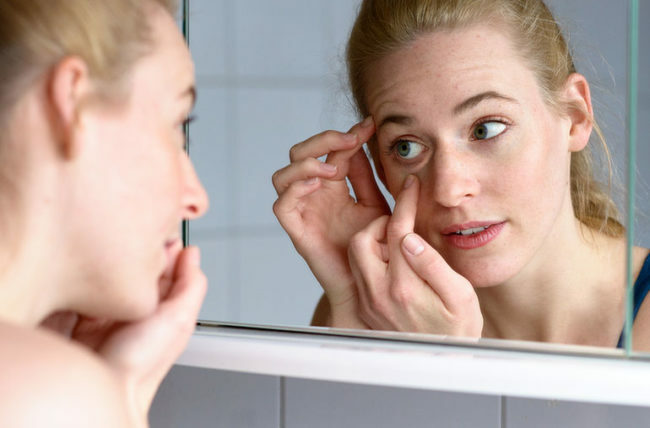 “If you follow these guidelines, your eye doctor can help to discover conditions that you might otherwise miss,” she says.